We estimate at least 375 people came to the campus lawn to share nature’s show and enjoy the sight together. Some families brought blankets and had picnic lunch in the shade of trees while waiting for the eclipse to begin. 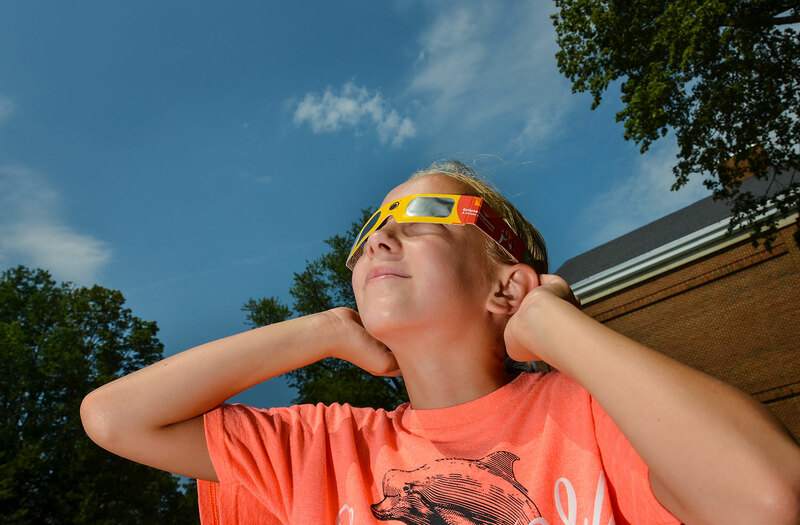 Driven by media reports, demand for Sun-safe eclipse viewing glasses was tremendous. Hiram had 300 eclipse viewers available for free distribution and even with restriction to one viewer per family or group, we ran out of glasses long before the eclipse ended. 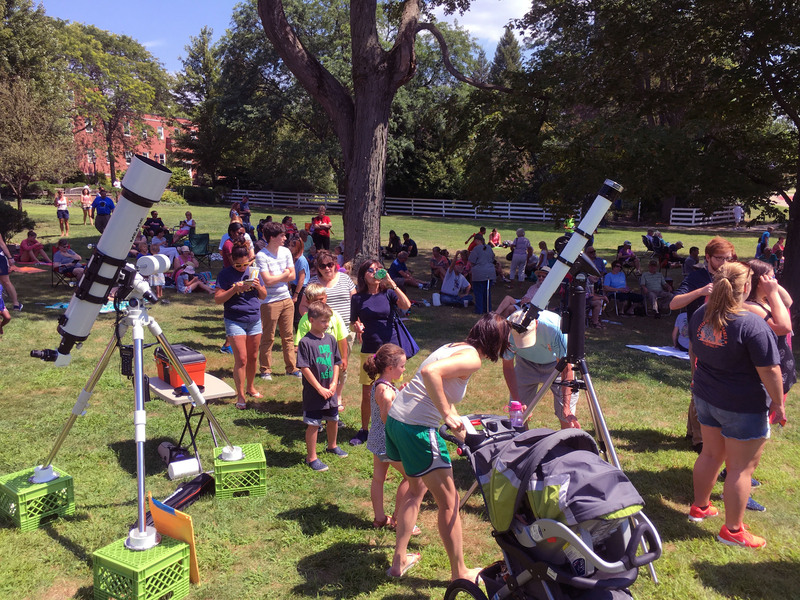 The offer of free eclipse glasses did, however, encourage some of our attendees to come out to Hiram College and discover there was more to enjoy than a giveaway; the view through our telescopes was tremendous. 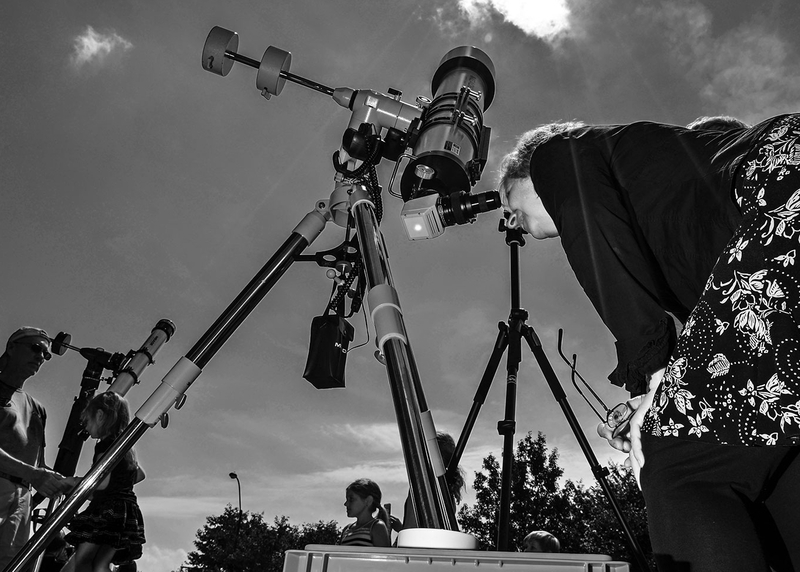 Three telescopes offered safe views of the eclipsing Sun three different ways. One scope employed a glass filter with metal compounds that absorbed the Sun’s dangerous radiation and presented an orange-tinted image. The largest telescope present, a six-inch refractor, was outfitted with a modern version of the Herschel Wedge; that telescope focussed unfiltered light into the wedge which, in turn, deflected all but a small amount of light with a green tint and offered tack-sharp viewing of the disappearing Sun, sunspots, and granulation texture in the solar atmosphere. A third instrument was a telescope specifically made to view the Sun only hydrogen alpha (Ha) light. Ideally, an Ha scope will show details of the solar atmosphere invisible to those using other methods, and include solar prominences — geysers of plasma arcing high above the Sun — but none were seen this day. People of all description came and went during the event though most stayed until the maximum eclipse had been reached and the Moon began to recede from Sun. Lines of folks waited patiently to see the telescopic views, even attempting smart phone photos; there were many repeat views, observing the progress of the eclipse with each fresh look. We estimate at more than 375 people came to the campus lawn to share nature’s show and enjoy the sight together. There was learning, and laughter, and a fine day shared under Sun and Moon. It may not have been a total eclipse for those watching from Hiram College, but it was a total pleasure. Cooperative weather plus plenty of happy and excited people made the afternoon a wonderful occasion sharing a fine day featuring a dance by the Sun and Moon. Before Maximum – Rough Edge. Look closely along the dark curve of the Moon moving over the Sun and note “bumps” along the edge: the silhouettes of craters and mountains on the Moon. 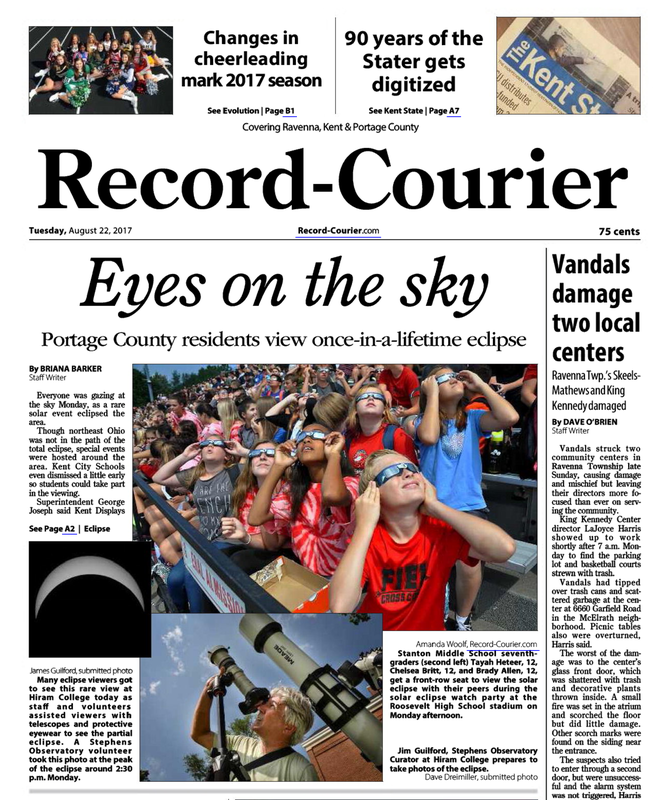 The (Ravenna) Record-Courier made it front-page news! 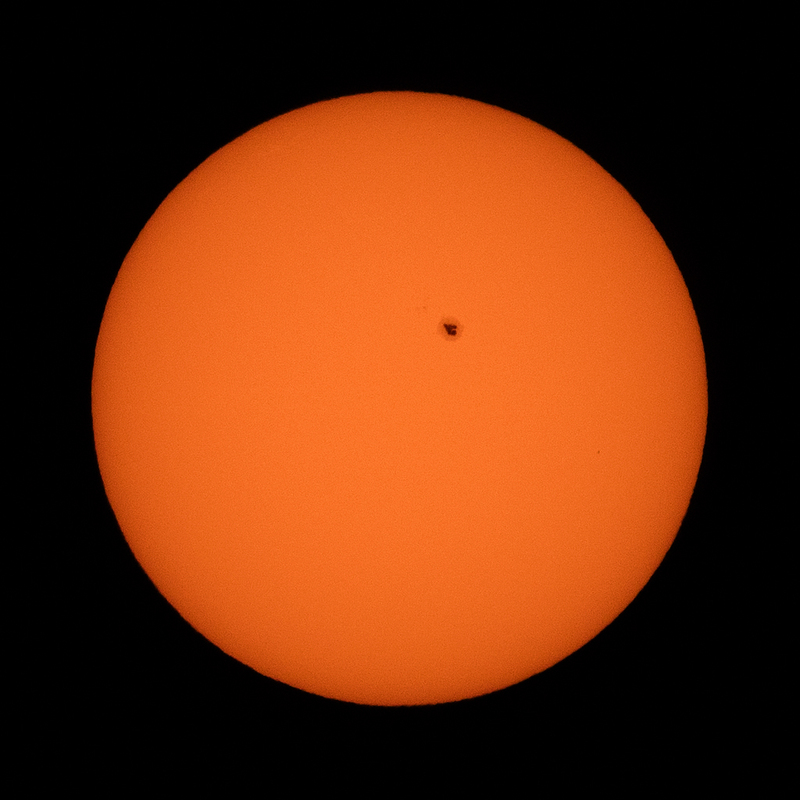 Mercury’s Transit in Progress: Mercury is the tiny dot at the lower-left. 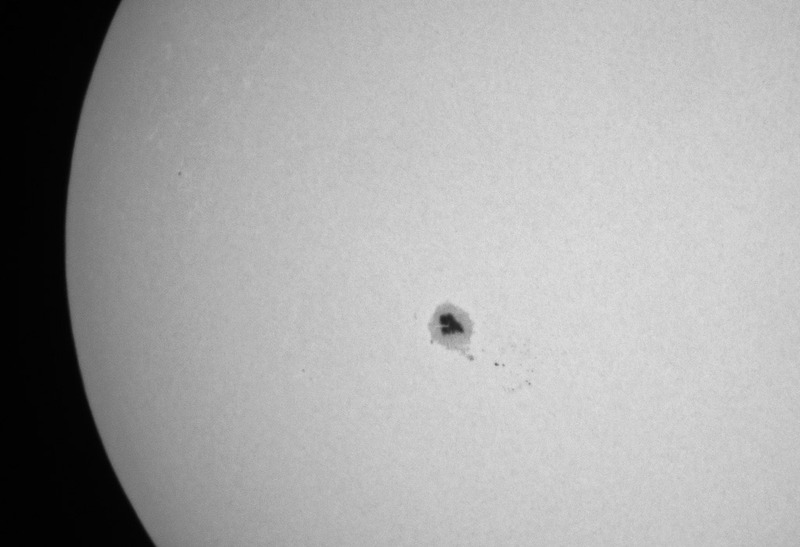 Smudge near the center is a group of sunspots. Photo by James Guilford. Our Solar System doesn’t care about the local weather. When something rare and interesting like today’s transit of Mercury across the solar disk takes place, it happens and there are no “rain checks.” And so it was this morning when the day dawned clear to partly-cloudy allowing us to glimpse the beginning of Mercury’s trek only to have the show stopped by rapidly encroaching clouds progressing to solid overcast! Transit of Mercury: Mother Earth’s atmospherics begin to block the view! Photo by James Guilford. At the predicted hour Mercury appeared as a tiny dot, silhouetted in the lower left-hand quadrant of the Sun’s bright disk. 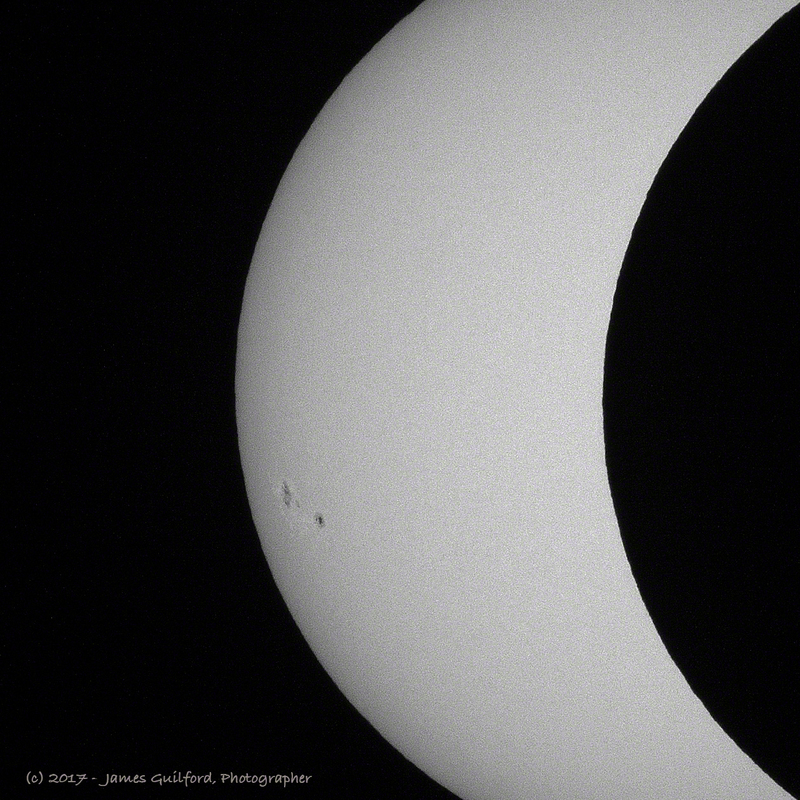 Using special protective filters, observers on the ground watched as the small dot slowly moved inward from Sol’s limb. Here in Northern Ohio, transit watchers were treated to the beginning of the show. Much of the nation missed out entirely, cloud cover already in place at dawn! 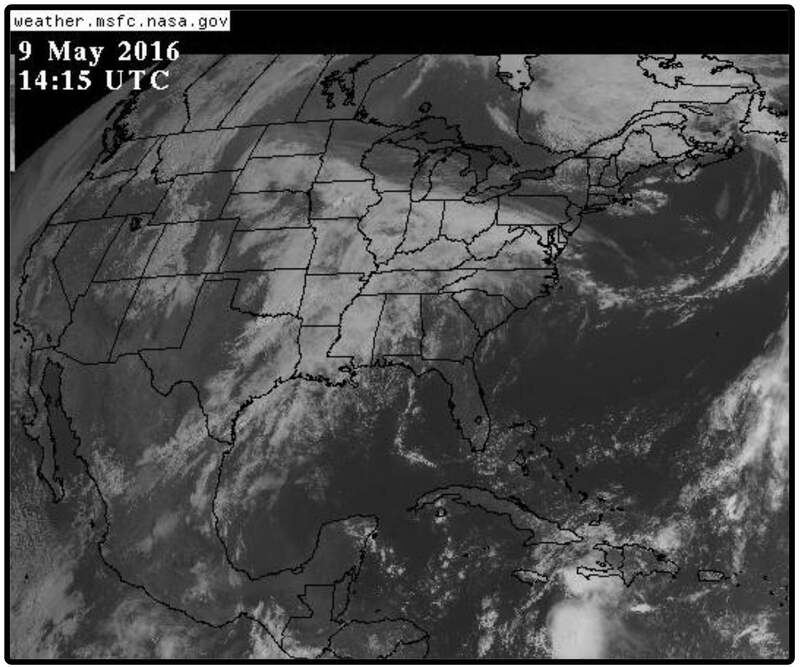 Weather Satellite Image: Much of the US cloud-covered during the transit event. NASA’s Solar Dynamics Observatory, a spacecraft, is unaffected by Earth’s pesky atmospherics and its technology produces some very dramatic images. One of my favorites shows Mercury about to cross between the satellite (us) and the Sun’s glowing photosphere; the planet has the active solar atmosphere as backdrop. Planet Mercury is 3,030 miles in diameter, not much bigger than Earth’s Moon, and looked every bit as tiny as it is compared with our nearest star! The View from Space. Credit: Data courtesy of NASA/SDO, HMI, and AIA science teams. Today’s transit of Mercury took place over several hours. 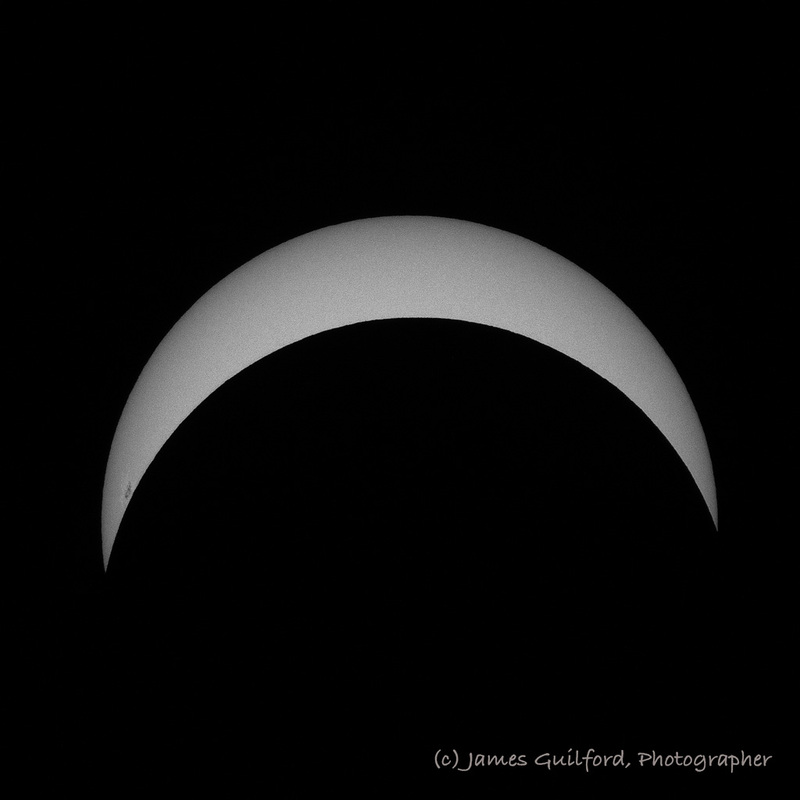 For us in Northern Ohio, the transit began at about 7:12 AM Eastern Daylight Time with the Sun barely up. Midpoint of Mercury’s passage was at 10:57 AM, and the transit ended at 2:42 PM. Because of the orbital inclinations of the inner planets, the alignment needed to produce a transit of Mercury happens only about 13 times per century making even a glimpse of the event something special. After today’s, the next transits of Mercury will take place in November 2019, November 2032, and November 2049. At least we won’t have to wait for so long as we must for the next transit of Venus — that happens in December 2117. 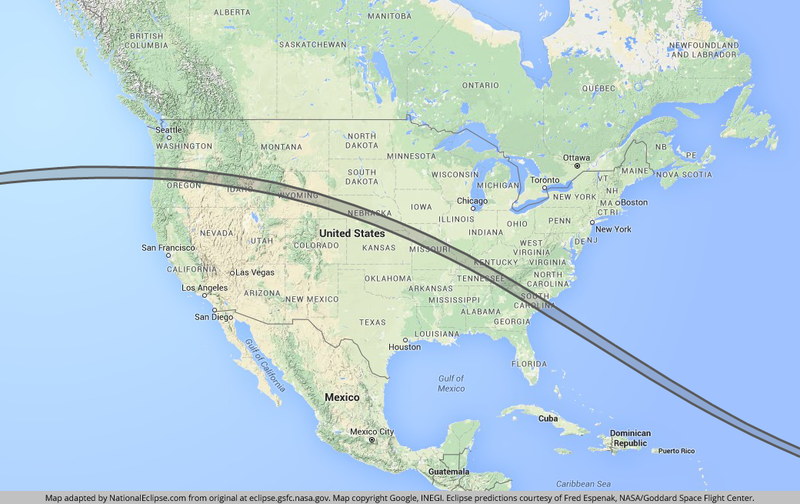 On Monday, May 9 solar observers in North America will be able to see the silhouette of planet Mercury as it passes between Earth and our Sun. 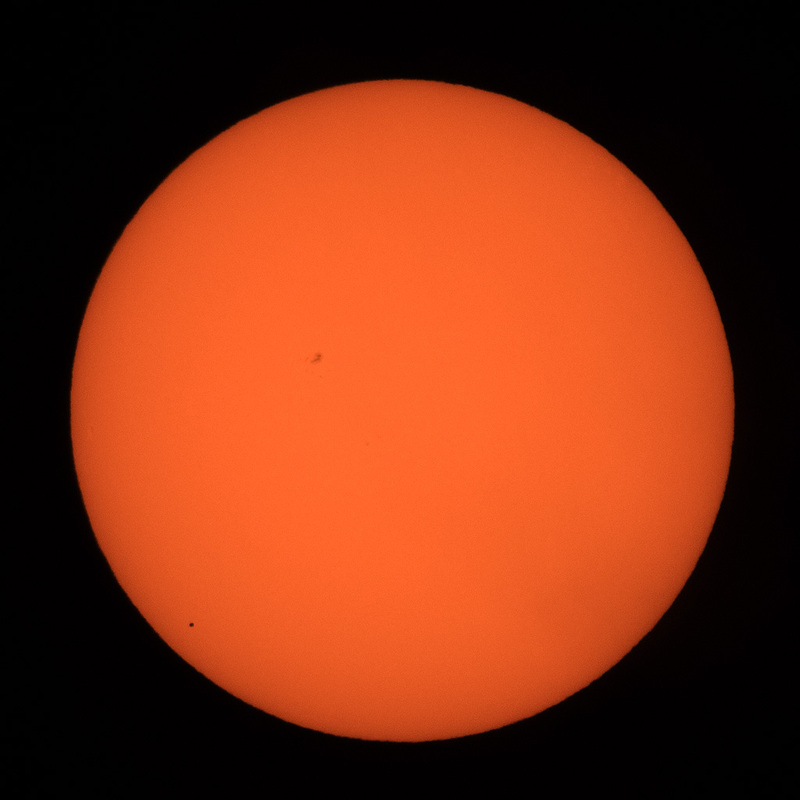 The event, called a transit, is relatively rare — though not so rare as a transit of Venus — and may cause interest in viewing the Sun. WARNING: Looking at the Sun, especially through optical instruments, requires extreme caution! Permanent vision damage can result if proper precautions are not taken! 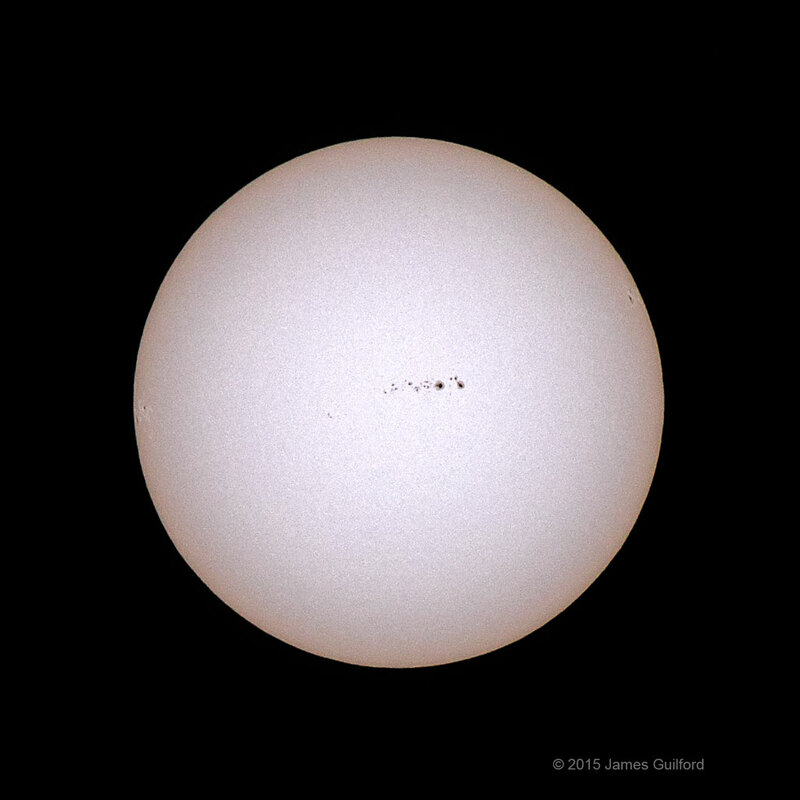 Click here for a good article on safely observing the Sun. At present we DO NOT plan to open Stephens Observatory for the transit but if plans change, the announcement will be made here — check back later. 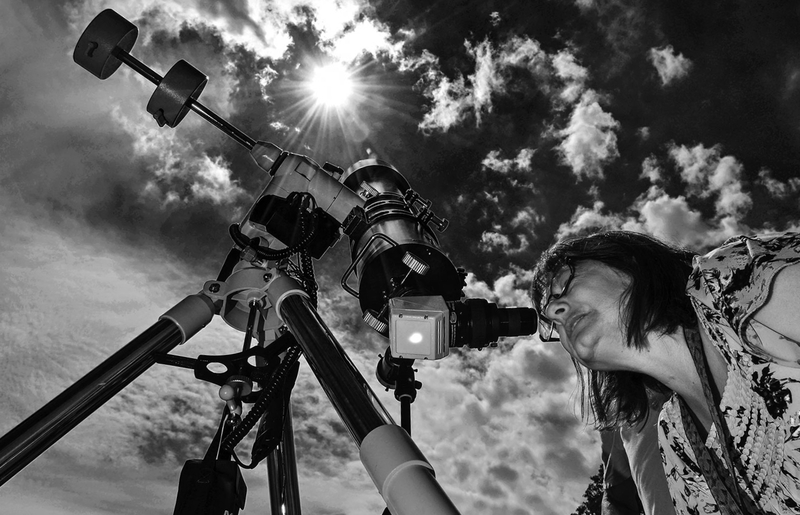 If conditions are clear, we hope to post images made via telescope at a remote location. 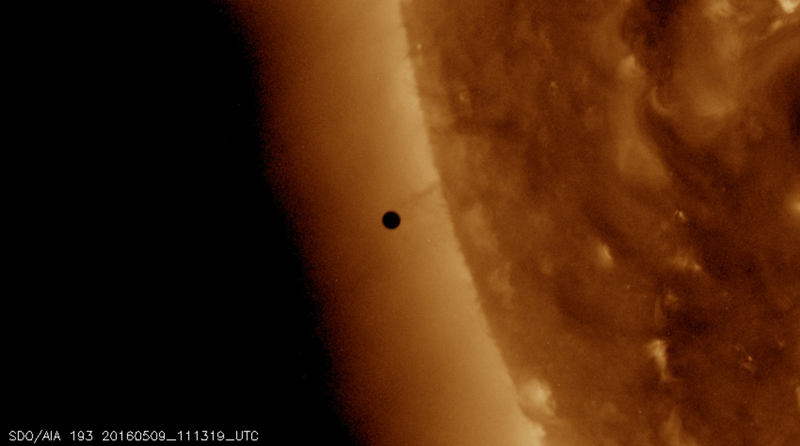 Tiny planet Mercury will appear as a correspondingly tiny black dot against the Sun’s brilliant disk. If any sunspots are present on Sol’s face, compare them with Mercury: the planet will be distinctly round and noticeably darker than sunspots, and from minute to minute it will move — sunspot motion takes days! May 9 Transit of Mercury – Note how the orbits of Mercury, Venus, and Earth are “tilted” making line-of-sight alignment a rare occurrence. Viewed from Earth, transits occur when one of the inner planets crosses the line of sight between our world and the Sun; only Venus and Mercury are ever able to do that. 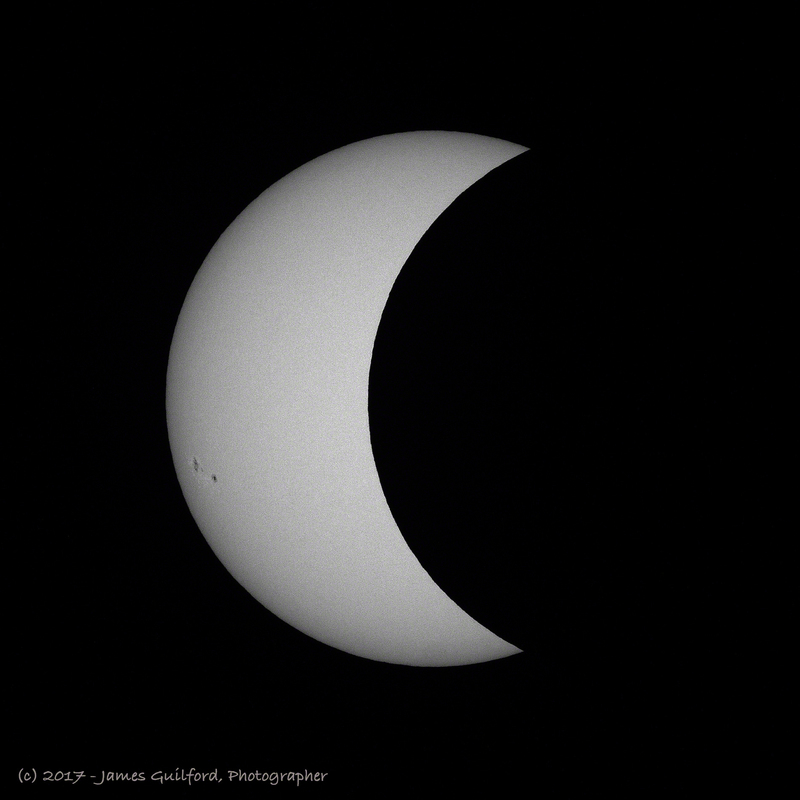 A transit, then, is a bit like a solar eclipse only viewed at a greater distance and blocking only a small amount of the Sun’s light. Transits would occur more often but for the fact that the orbits of Mercury and Venus are “tipped” so that they do not align along the same plane as Earth’s path. Only when the planets are in the right position where the line of sight passes straight through to the Sun do we see transits and with Mercury, that happens only about 13 times per century. After May 9, the next transits of Mercury will take place in November 2019, November 2032, and November 2049. 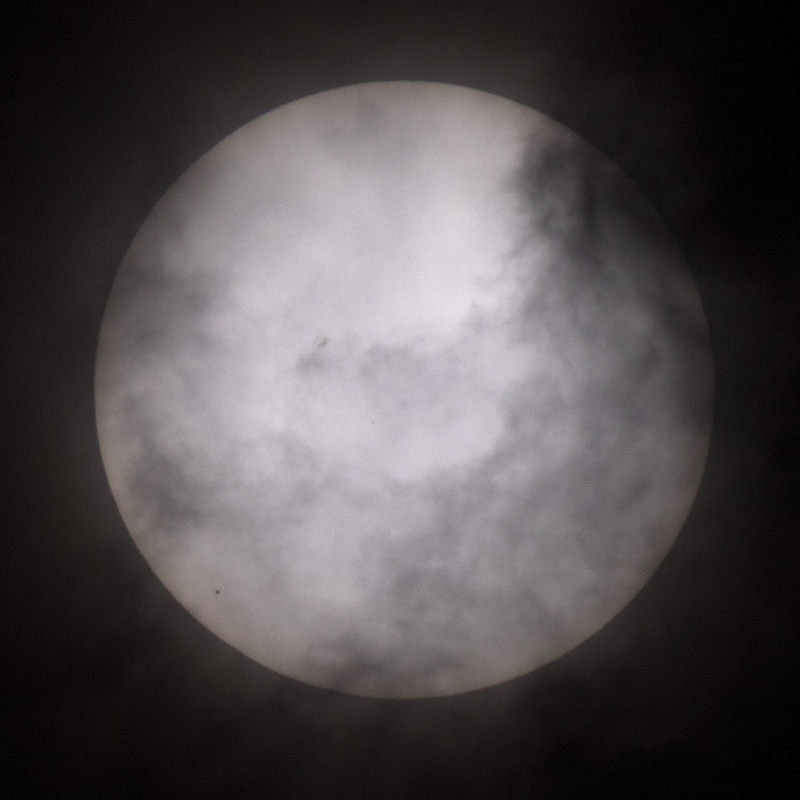 The most recent transit of Venus took place in June 2012 and will not be seen again until December 2117. Monday’s transit of Mercury will take place over several hours. For us in Northern Ohio, the transit begins at about 7:12 AM Eastern Daylight Time with the Sun low in the east. Midpoint of Mercury’s passage will be at 10:57 AM, and the transit ends at 2:42 PM. Cloudy skies? Don’t have proper gear to view the Sun? Fret not! There will be “live” webcasts of the event from various sources during Mercury’s passage. Use your favorite web search engine to find good sources and check for a planned broadcast via NASA TV. NASA will stream a live program on NASA TV and the agency’s Facebook page from 10:30 to 11:30 AM — an informal roundtable during which experts representing planetary, heliophysics and astrophysics will discuss the science behind the Mercury transit. Viewers can ask questions via Facebook and Twitter using #AskNASA. We hope to post a few links here later.